Owner is relocating back East. Tesla Solar! 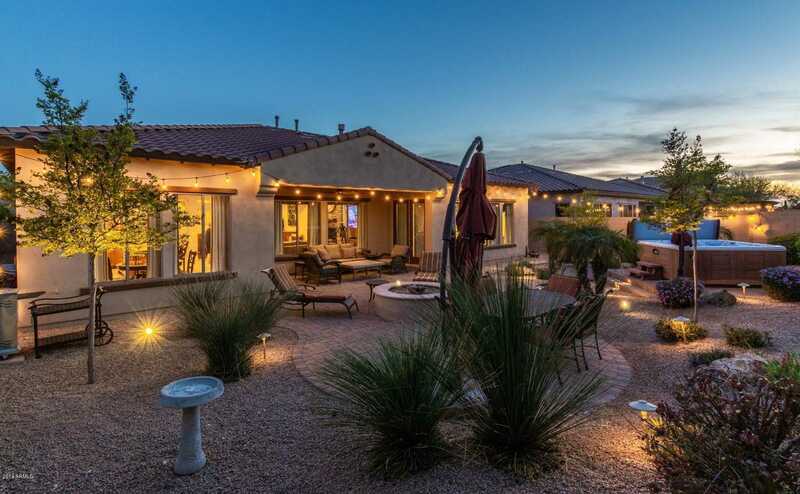 Just south of the famed Carefree Hwy in the gated community Desert Vista of Sonoran Foothills is a luxurious retreat with a Hot Springs Hot Tub in the flourishing location of North Phoenix Sonoran Desert. Meticulously maintained by an owner who has thought of everything. 4 bed plus den, 3.5 bath 3,078 sq ft and 2 owner’s suites and the main master bdrm has His/Her walk-in closets, 3 car over-height tandem garage…and a backyard built for entertaining and unwinding. Gather with family and friends in the open kitchen w/granite countertops, built-in GE Monogram fridge, 5 burner gas stove and huge island. Surround sound in 3 rooms plus patio, 8 ft solid wood interior doors, closets with extra storage shelves and pantry with pull out racks. Directions: Paloma Pkwy, east on Desert Wild Flower, 1st left at 18th Ave, once thru gate – left at round-about, then 2 right turns to Bramble Berry Rd, house on left. Approximate size: 9685.00 sq. ft. Please, send me more information on this property: MLS# 5907833 – $550,000 – 1812 W Bramble Berry Lane, Phoenix, AZ 85085. I would like to schedule a private showing for this property: MLS# 5907833 – $550,000 – 1812 W Bramble Berry Lane, Phoenix, AZ 85085.